Whether you prefer a travel trailer or motorhome, and regardless of whether your ideal vacation is on a tropical beach or high on an alpine mountain peak, there’s one thing all campers — and everyone else, in fact — share in common. You’ve gotta eat. And for RVers, it’s all about whipping up your favorite tasty meals in your very own camping kitchen, helping you save money and continue your healthy lifestyle no matter where the road may lead. Of course, even the most well-stocked motorhome’s kitchen isn’t quite the same thing as cooking in your sticks-and-bricks home. RVs offer limited space, which can make for a pretty interesting kitchen situation: you’ve got to cram all your food and cooking equipment into the confines of your RV’s cabinets. Which is why investing in the right kitchen accessories for your camper is so important. 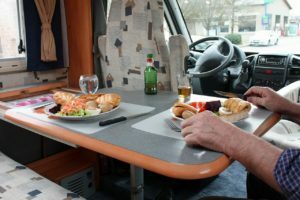 Gadgets and gizmos can make any kitchen more convenient… but when you’re RVing, they can mean the difference between enjoying a usable cooking area and falling back on eating restaurant meals three times a day. If it’s too much of a pain to operate in your cramped camper space, you may quickly find yourself hemorrhaging money on diners, drive-thrus and dives. Fortunately, we’ve been around the block a time or two in our own RVs, and we have a good idea of which RV kitchen gadgets and supplies are worth investing in. Without further ado, here are our best suggestions for kitchen gadgets that’ll improve your camping experience tenfold. You’ve heard us say it before, and, full disclosure, you’re likely to hear us say it again: an Instant Pot is pretty much a must-have. Most of us here at RVshare HQ wouldn’t dare leave home without our trusty pressure cooker. 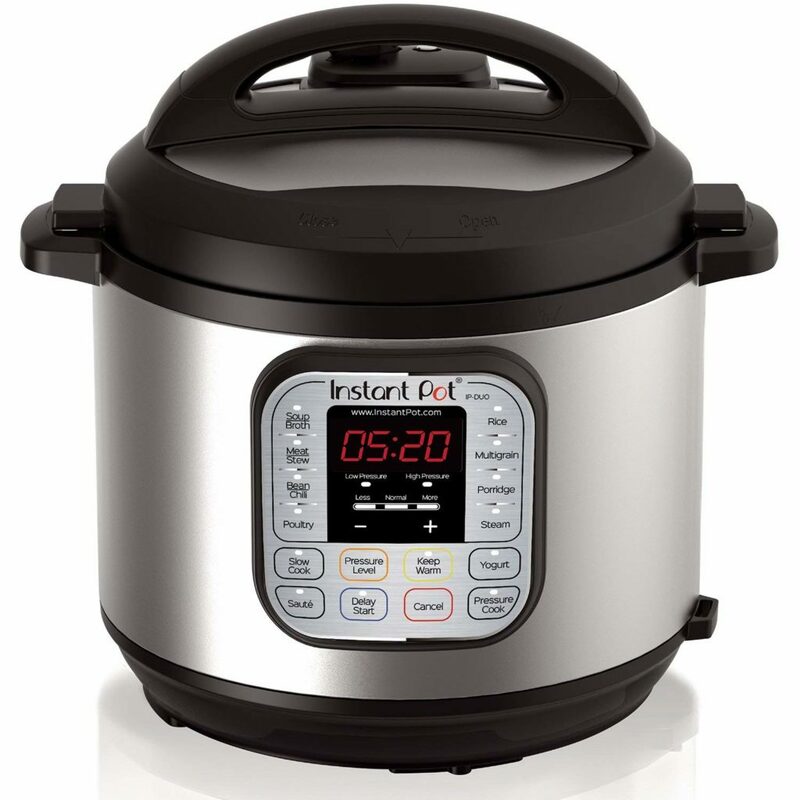 As far as RV kitchen appliances go, the Instant Pot is tops. It packs nigh-endless utility into one small footprint… and it’s available for a very reasonable price. From cooking up staples, like perfectly-fluffy rice, to trying out more exotic applications, like making your own yogurt, you’ll get as much out of your Instant Pot as you put into it, and then some. We’re such serious Instant Pot fans, in fact, that we wrote an entire post about why you need one in your life — and a few creative recipes to try once you get one. We also recommend picking up an Instant Pot-specific cookbook, like The Instant Pot Bible by Bruce Weinstein and Mark Scarbrough. You can also find a ton of Instant Pot recipes online if you’d rather not waste precious space on a chunky cookbook! What goes together better than camping and grilling? 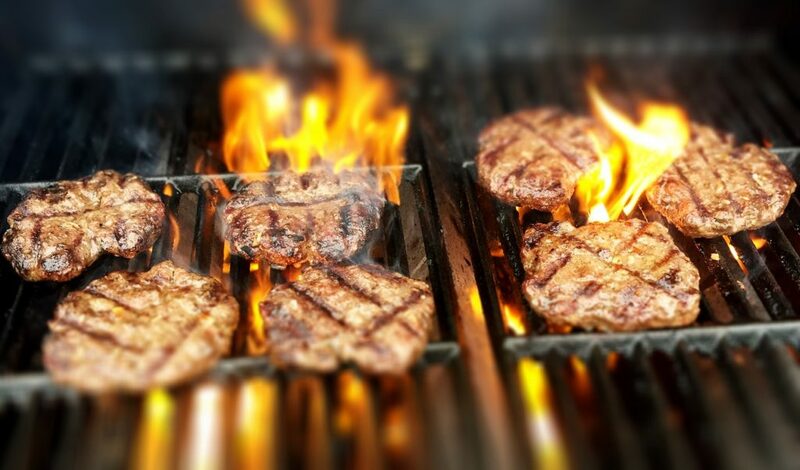 Although many developed campgrounds offer grills as part of their campsite packages, if you’re into boondocking or camping at lower-key state parks, you might not have access to a barbecue. And if you ask us, that access is critical. Don’t think this is the most creative suggestion? Try us. Because when you know your way around one, a toaster oven can do so much more than make toast. For instance, have you ever had toaster oven quesadillas? Cheese, pita, toppings, fold: boom. Tex-Mex bliss. Throw some tomato sauce and cheese onto an English muffin, and you’re looking at toaster oven pizza in a flash. Heck, you can even cook an actual frozen pizza in a toaster oven… and it’ll come out a heck of a lot crispier than it would after a trip through the microwave. 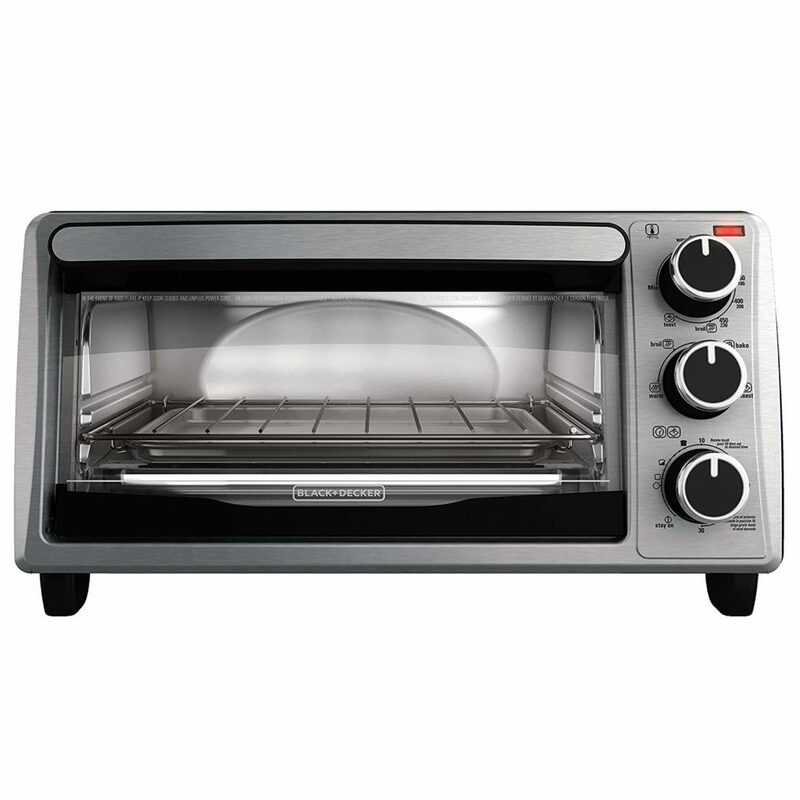 Especially in RVs that don’t offer access to a conventional oven (or even a convection oven via the microwave), a toaster oven can get you all the crispy, crunchy treats you’re craving, from bread-based items to cleverer uses like roasted veggies. And although it takes up a little bit of storage space, it more than pays its way in utility! And, of course, it’s cheap… can’t argue with that. Once you’ve got the actual cooking part down, there are still some extra accessories to consider that can make or break your RV kitchen experience — sometimes, almost literally! 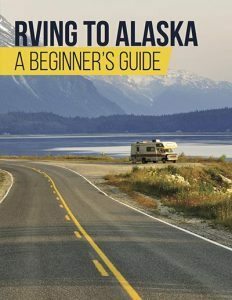 Here’s the thing about RVs: they move. That is kind of the point, after all. But traditional plates and glassware don’t really take well to the whole bouncing around thing. If you just transpose your normal, everyday kitchenware to your RV, you’re bound to end up with chips and chinks… and maybe even full-on shatters. 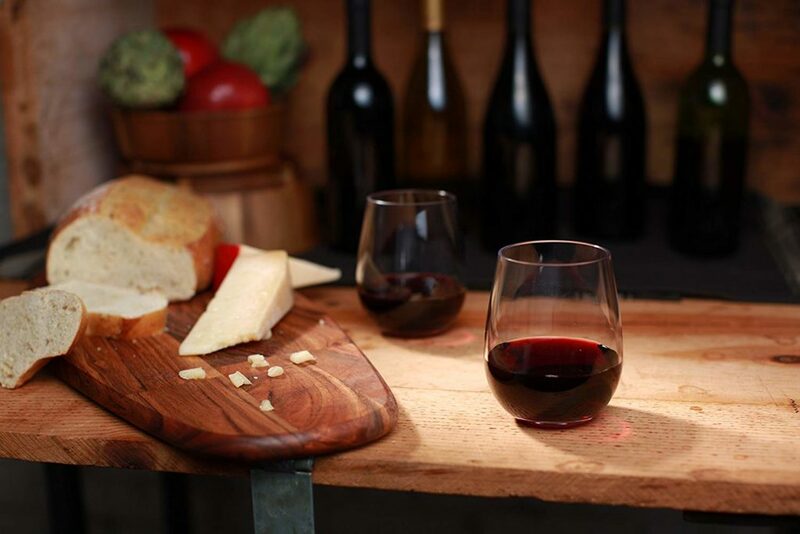 That’s why we suggest every RVer invest in a set of shatterproof dishware specifically for their rigs, as well as some unbreakable glasses so you can enjoy a drink with dinner in style. Plus, you won’t have to worry about schlepping your home dishes out to the RV every time you’re ready to set out on a camping trip — they’ll already be there waiting! If your RV does have a full-sized range or oven — or even just a hot plate — you’re going to need some pots and pans if you want to take full advantage of it. But if you purchase your cookware piecemeal, it’s likely to end up crowding your cabinets in a flash. These items are notoriously difficult to stack, especially with their lids. 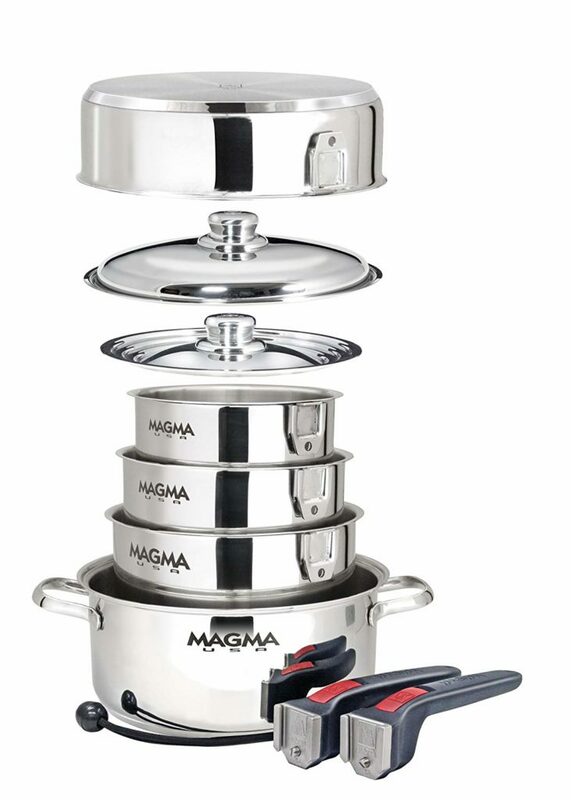 You can circumvent this problem ahead of time (and make sure you have all your cookware bases covered in one fell swoop) by opting for a pre-made set of nesting cookware, like this 1o-piece kit from Magma. It comes complete with three saucepans of different sizes, a saute and frying pan, interchangeable lids, and handles — so you’ll get the absolute maximum amount of utility in the smallest possible cabinet footprint. Not ready to blow $175 on a new set of cookware? We get it… so may we also suggest an alternative option: the kitchen cabinet organizer. This can help you finagle your existing cookware set into some sort of order by providing a helpful in-cabinet structure, all for less than $20. Can’t beat that for the price! Chances are, your kitchen is already the heart of your home when you’re, well, at home. 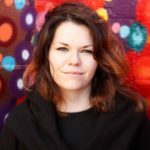 But the same is true of any RV or camper… after all, having access to a functional kitchen while you’re on the road is one of the most attractive parts of this style of travel for most of us!